I'm not sure what has happened in the past few weeks. I've lost my usual drive and desire to run. I guess that happens after pushing yourself so much. I managed to knock out a great 10k last weekend but other than that I haven't felt very motivated to run. I've even started skipping my usual running days. I thought busting out new running sneakers would help drag me out of my rut, but so far no luck. I bought a pair of Brooks Pure Cadence 2 while they were a great deal from DSW. So far they've been a nice change from my usual Adrenalines. I'm enjoying my mini break from running, even though I'm disappointed I won't hit 100 miles this month. I did try a new class and can't wait to write my review on my experience. On Saturday May 17th I ran the 10th anniversary Run! 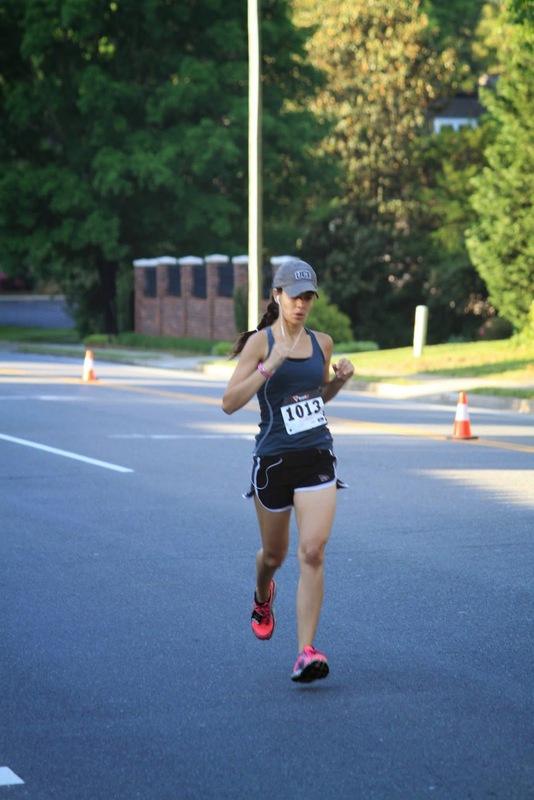 Ballantyne 10k/5k race. It was my second year participating, although last year I only ran the 5k while pushing Mason. Over 2,000 runners participated in the local YMCA race (both 5k and 10k), with over 600 10k finishers. I left Ryan and Mason at home and left our house around 7am for the race. By the time I parked I had less than 5 minutes to get to the start line. It was a chilly morning in Charlotte (about 48 degrees) so I wore my hot pink Pro Compression socks, shorts, and a long sleeve Nike shirt. I started off too fast and finished mile 1 in 7:12 minutes. I tried to slow down and get into a groove but was still too fast and finished mile 2 in 7:30 minutes. The 10k race is basically the same 5k course, ran twice. It's not very exciting in the least bit. It's a bit hilly with a noticeable incline between miles 2-3 (4-5). I think it finally caught up to me by mile 3 where I finished with a pace of 7:51 minutes. I had gone into the race wanting to finish in 50 minutes. The crowd support was great at the halfway mark and gave me a little boost. I finished mile 4 in 7:41 minutes. By this point I knew I could pump out 2.2 more miles and head home. Mile 5 was done in 7:49 minute pace. I finished the race with a nice kick at the end and had my 3rd fastest mile of the race, 7:42 minutes. The timing company, Jones Racing Company, had live results on their website and after looking myself up I saw I was 6th in my division. I texted Ryan and let him know I wouldn't be staying for the awards ceremony and would head home. I'm glad that I looked up the official results because I just noticed I placed 3rd! I must add that the girls in my age group are damn fast. I always thought Red Robin was a fast food restaurant ... maybe a step up from McDonald's on the 'fancy' scale. I had no idea it was an actual sit-down restaurant until this past Friday night when we stopped by for my first ever experience. It has been racing tradition to eat a cheeseburger the night before most of my runs. I've found that I run my best races when I eat a cheeseburger and drink 1-2 beers (usually Michelob Ultra). It's just science. I customized mine by asking for no lettuce and tomato, add onions and pickles, and swapping out the Red's Secret Tavern Sauce for their new Roasted Garlic Mayo. Instead of steak fries I opted for their sweet potato fries. The burger was quite tasty. Each patty was roughly 3 ounces so I didn't feel overly stuffed after eating it. The sweet potato fries were way too salty ... as was Mason's grilled cheese. Who puts salt on a child's grilled cheese sandwich? I tried his steak fries and they were undercooked and bland tasting. After my sweet potato fries upcharge (1.49 extra) plus Ryan's $12 burger, I found myself thinking that this restaurant was more costly than our tastier local burger joints. So I probably will not be heading back to Red Robin for a meal any time soon. At least I tried it and don't have to wonder what the food is like. it's crazy what taking 4 days off from running will do to your stamina and drive. ordinarily I would agree that a short break is necessary to remain refreshed and eager to run, but 4 days is just too much of a break. I forced myself to run 6 miles today, knowing it would be my only chance before the 10k this Saturday. I struggled once I hit the 1/2 way mark but picked it up for my final mile. It is ridiculous how hot it has already gotten in Charlotte. I wish we wouldn't have skipped spring and jumped right into summer. It already seems too hot outside to run from 9-10am. looking forward to easing myself back into running this week after spending the weekend walking everywhere in New York City. I love me a good pun ... so today's title, "a nice change of pace," is actually two-fold. I ran this morning at a much slower pace than what I consider to be my latest normal and I was ok with that. I woke up this morning with slight hip pain and didn't think I should've ran at all, but I'm stubborn and knew I would be taking Saturday and Sunday off and didn't want to miss out on the miles. I started off with 1 minute of walking and told myself to keep it slow. After 2 miles of running I promised myself I could walk during the 4th mile. Of course that didn't end up happening and I ended up running all 4 miles. I was able to head home after some Starbucks and a couple of quick errands for a shower and a snack. Then I headed back out for another errand before heading to Mason's school for pick-up. Anyways since I never really post about what I'm wearing, I decided to do a quick description of today's super casual and comfy outfit since dressing "up" was also a nice change of pace for me. Wearing a cotton skirt and a simple black tank is such a step up from the usual running apparel. It was nice to get out of my comfort zone and look presentable for once. When we lived in FL we would eat at Tijuana Flats ALL OF THE TIME. We were super sad when we moved to Charlotte and noticed they didn't have any of these restaurants. Lucky for us they opened a location super close to Mason's school. I come to Tijuana Flats every Tuesday for taco Tuesday ... Great special 2 tacos, chips, and a drink for $5.49. I'm working hard on being a true regular here where they'll know my order. I set my goals really high. Perfect post running meal after running 6.35 miles. On Saturday May 3rd I ran in the Trysports Mayday 5k. It was my first time running this race and I had only heard about it through an emailed coupon offer for $10 off registration. At only $15 (plus $2.50 for transaction fee) this was one of the least expensive races I have ever ran. I was even able to convince my friend Shannon to run the race too! Ryan and Mason came with me on race day and we had plenty of time to pick up my timing chip and wander around before the race start at 8am. The race originally had a 1 mile option as well, but was canceled due to lack of participation prior to race day. There was no timing belt at the start of the race so I made sure to stand in the front of the pack before race time. I think we all started at someone's shouting of "on your mark, get set, go!" I honestly think I started off too fast. I was running alongside some speedy men and was the only female for the first minute of the race. After that a speedy woman (who took 1st place overall in females) left me in the dust. I finished mile 1 in 6:54 minutes and kept trucking along. Around 10 or 11 minutes two women and their trainer (a dude) ran past me. I knew I had slowed down a bit and finished mile 2 in 14:25 minutes (7:29 pace). At this point I had started to lose steam but knew that with only 1 mile left I had to push it to the finish. I picked up the pace and was able to pass one of the females ahead of me. Mile 3 was done at 21:40 minutes (7:15 pace), and I got to see Ryan and Mason cheering me on right before the finish. Official race time finish was 22:27 minutes. At only 115 finishers this was definitely a small race. The first place female finished in 20:51 minutes, and the second place female finished in 22:05 minutes. Congrats to Shannon for placing 2nd place in our age group, females 30-34. Overall it was a great race with an awesome course ... not too hilly but definitely had a few scattered throughout the 3.1 miles. Bananas and oranges at race finish with water. Kind of disorganized post race/awards ceremony situation (for example they gave me a 2nd place certificate because they couldn't find the 3rd place ones). Top finishers (male and female) received a pair of running shoes as their prize so that's pretty neat. I would recommend this race to locals and would definitely try to sign up for this race again in the future!